Permaculture from permanent and agriculture — is an integrated design philosophy that encompasses gardening, architecture, horticulture, ecology, even money management and community design. The basic approach is to create sustainable systems that provide for their own needs and recycle their waste. 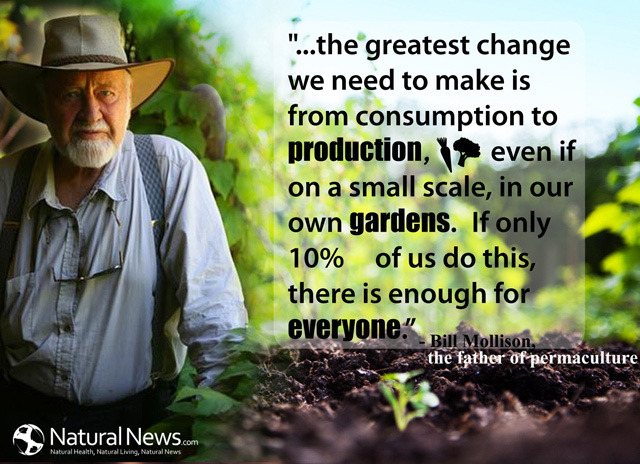 Mollison developed permaculture after spending decades in the rainforests and deserts of Australia studying ecosystems. He observed that plants naturally group themselves in mutually beneficial communities. He used this idea to develop a different approach to agriculture and community design, one that seeks to place the right elements together so they sustain and support each other. London: Permaculture teaches us how to use the minimum amount of energy needed to get a job done. Mollison: That’s right. Every house should be over-producing its energy and be selling to the grid. We have built entire villages that do that — where one or two buildings hold the solar panels for all sixty homes and sell the surplus to the grid. In seven years, you can pay off all your expenses and run free. London: Short of starting a farm, what can we do to make our cities more sustainable? Mollison: Catch the water off your roof. Grow your own food. Make your own energy. It’s insanely easy to do all that. It takes you less time to grow your food than to walk down to the supermarket to buy it. Ask any good organic gardener who mulches how much time he spends on his garden and he’ll say, “Oh, a few minutes every week.” By the time you have taken your car and driven to the supermarket, taken your foraging-trolley and collected your wild greens, and driven back home again, you’ve spent a good hour or two — plus you’ve spent a lot of money. London: Even though permaculture is based on scientific principles, it seems to have a very strong philosophical or ethical dimension. Mollison: There is an ethical dimension because I think science without ethics is sociopathology. To say, “I’ll apply what I know regardless of the outcome” is to take absolutely no responsibility for your actions. I don’t want to be associated with that sort of science. London: What do you think you’ve started? Mollison: Well, it’s a revolution. But it’s the sort of revolution that no one will notice. It might get a little shadier. Buildings might function better. You might have less money to earn because your food is all around you and you don’t have any energy costs. Giant amounts of money might be freed up in society so that we can provide for ourselves better. So it’s a revolution. But permaculture is anti-political. There is no room for politicians or administrators or priests. And there are no laws either. The only ethics we obey are care of the earth, care of people, and reinvestment in those ends. New findings of operations that can benefit from “vertical farms”? Vertical food production can take advantage of stranded assets, such as old thermal power plants. Urban food production can offer to more consumers local fresh food produced sustainably with less waste. America is having to rethink where and how it produces its food. In the 21st century, the U.S. food system is likely to change even more than it did in the past century. Because of climate change, major production areas such as California will experience extremes in temperature and precipitation, generally growing hotter and drier — and all at a pace that appears to be happening sooner than predicted. The U.S. food system needs to diversify production. But instead of expanding into grasslands or areas already used for other crops, we should think about growing food at scale in big cities. Would our food system benefit from “vertical farms”? And if so, can we seize an opportunity to use existing, stranded assets? 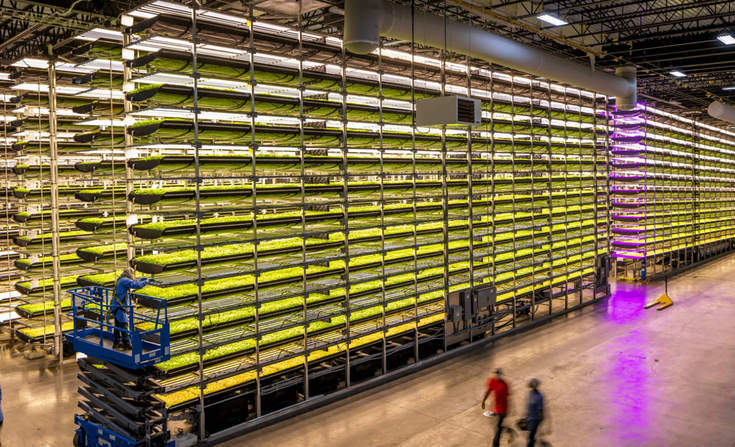 Vertical farms are usually indoor operations with stacked or wall-like planters that leverage networked technology to monitor and nourish plants precisely, often without the use of soil. At least 100 vertical food production startups are in U.S. cities, but few take advantage of stranded assets, such as old thermal power plants. Thermal power plants have qualities that make them inherently amenable to vertical farming. They consume about 45 to 50 percent of all the water used to cool plants during power generation. Disposing of the hot water is both a nuisance and a cost. Heat, water, energy and captured slipstream emissions are all byproducts of energy generation and could be available for producing food.There are social advantages, too. In most urban areas, thermal power plants are surrounded by low-value brownfields that have little or no productive use. Many have had to be been taken over by cities for back taxes, and they are usually in “food deserts” — poor neighborhoods with little to no access to grocery stores with fresh produce. These areas could benefit from vertical farms and fresh produce. Vertical farming can create business opportunities. The centralization and specialization of food production have put considerable distance between consumers and their food, both figuratively and literally. By creating vertical, urban food production, we can narrow that gap and give more consumers what they want: local food produced more transparently and sustainably, with less waste and fewer impacts. Power companies can benefit from added value; retailers can benefit from shorter supply chains and reduced waste; government agencies can improve local food systems; communities can eliminate their food deserts; tech companies can drive research and development, and academics and research institutions can build capacity about new ways to grow our food. A true achievement for Apple, to hit the magic 100% goal of running all its facilities and its worldwide fleet of Apple stores solely powered by renewable energy. The achievement of green energy is the culmination of a furious effort over the past six years that involved financing, building, or locating new renewable energy sources, such as solar and wind farms, near the company’s facilities. 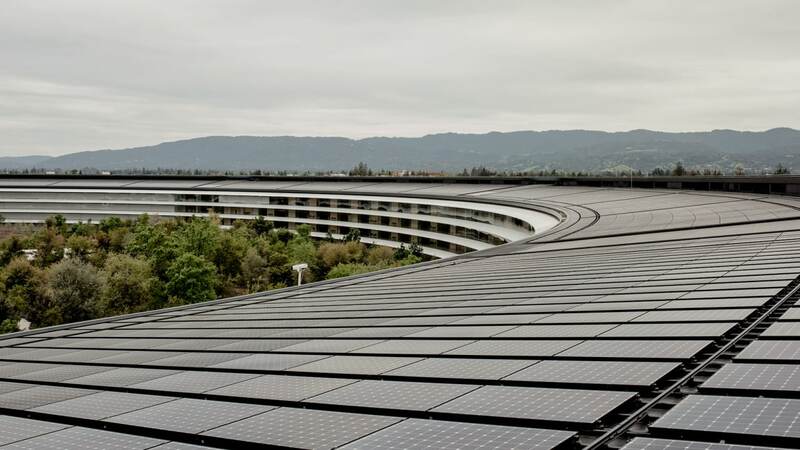 Apple says it now has 25 operational renewable energy projects–with 15 more now in construction–in 11 countries. Just eight years ago, only 16% of its facilities were powered by renewable energy. By 2015 that number had increased to 93%, then to 96% in 2016. Along the way, in 2013, Apple signaled its seriousness about green initiatives by hiring former EPA administrator Lisa Jackson as VP of the environment, policy, and social initiatives. CEO Tim Cook wanted Jackson to focus Apple’s environmental initiatives, and perhaps act as a respected emissary to Washington, D.C. She’s done both. The overarching goal of Apple going 100% green is, of course, is to reduce harmful emissions from dirty fuels. The company says it’s reduced its greenhouse gas emissions (CO2e) by 58% since 2011, preventing 2.2 million metric tons of CO2e from entering the atmosphere. But Apple’s own progress as measured by the numbers isn’t the only point. In places where it has facilities, the company has often been a catalyst, working with local utilities and regulators to build new solar or wind farms that pump new green power onto the public grid. Jackson told me Apple especially likes to do this in markets where the majority of the existing energy comes from ecologically unfriendly sources like coal or oil. “It’s an approach that’s really important because you’re growing the clean energy market around you,” she says. Lisa Jackson is optimistic about energy’s renewable future. “As the markets continue to develop, I don’t see anything that’s going to stop the trajectory toward lower-carbon energy worldwide,” she says. “At some point, you’ll just see countries doing it.” When they do, Apple, along with other tech giants, will deserve some of the credit for getting the flywheel going–a contribution to the betterment of humanity which might well be as meaningful as any new gadget it will sell in its stores. Now, this is huge! Urban India is engaged in a true farming revolution: local organic food production from rooftop gardens to spaces between buildings and also indoor areas designated for farming. The agritech startup Pindfresh is turning small plots or spaces between buildings or in buildings into usable farm space. 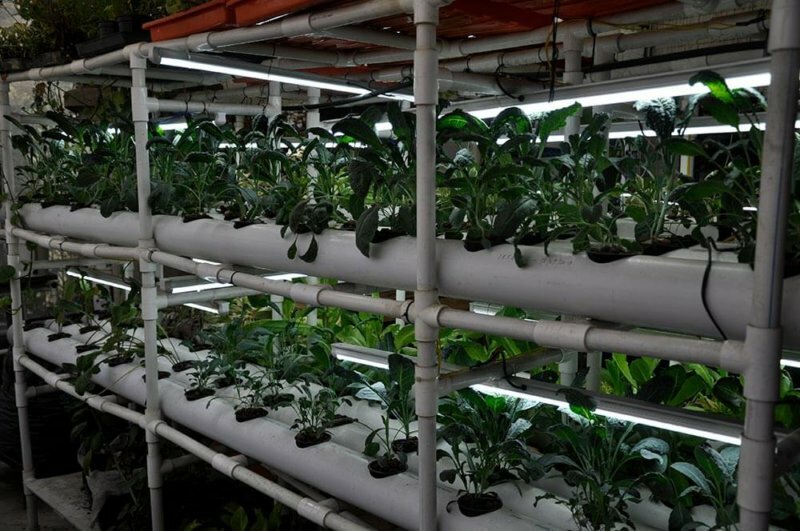 From rooftop gardens to floors specifically designed to incorporate farming, to other spaces within ­­high-rises filled with racks of perfectly lined leaf vegetables, it is striving to bring about a farming revolution in urban India. Apart from selling in-house home systems (hydroponic and others) and fresh produce (lettuce, rocket, basil, and mushrooms), it also runs programmes to train people (in schools and societies). 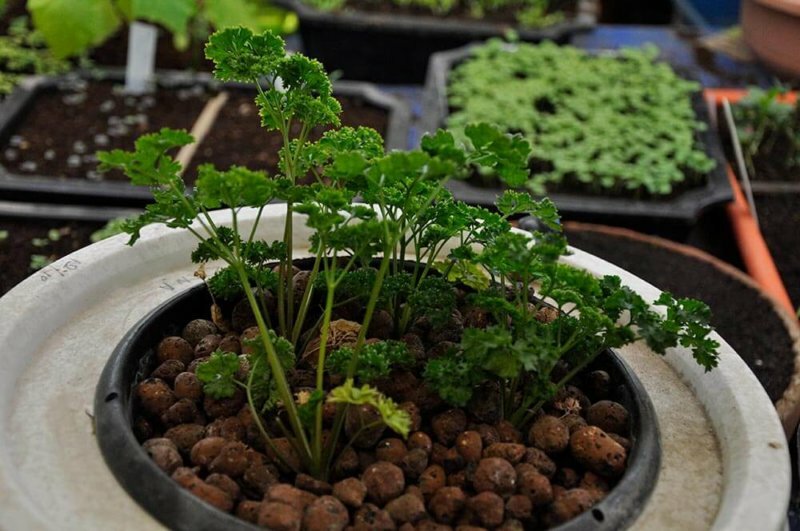 By using hydroponics, cocopeat gardening, and other soilless techniques, Pindfresh is attempting to educate urban dwellers to use a technology which takes less space, demands lesser water and is completely free from pathogens and biological contaminants. The urban population in India, which stands at 377 million, is expected to reach 600 million by 2031, according to a new UN-backed report. The increasing nutritional requirements of this fast-growing urban population will pose a huge challenge in the coming years. Due to the ever-increasing urban population and decreasing rural population that used to tend to frame as a traditional occupation, India imported $906.3 million (INR 5,897 Cr) worth of fruit and vegetables in 2016-17, while the figure in 2014-15 was $832 Mn (INR 5,414 Cr). As a result, Indian consumers are becoming victims of processed food as there is a wide gap in the supply and demand chain. The startup is attempting to make cities holistic in their requirements of food and vegetation. To that end, it is working towards creating systems by which people will actually eat the local and fresh produce – just as if the food is coming directly from the Pind. Essentially, they offer three services: creating and selling systems for home and commercial use; producing food using Pindfresh systems and selling it and holding workshops. The startup is grossing over a monetization strategy that involves making the vegetable saplings available for procurement by offices and houses. They have two types of customers: one who buys the plants to grow the vegetables themselves and those who only buy the vegetables. Pindfresh is also selling to wholesale markets. Prescribing Healthy Food Could Save Billions in Healthcare Costs?